It wasn’t because of Trump. That would be a book unto itself. Instead, the genesis of this book is rooted in the disbelief and alarm I felt because of the extreme obstructionism of Congressional Republicans during the Obama years. In 2009 the Republican Senate Caucus led by Mitch McConnell adopted the legislative policy summed up by one of their own: “If Obama was for it, we were supposed to be against it” (Senator Voinovich of Ohio), the result of which led them to refuse to consider anything the President proposed, including his Supreme Court nomination at the beginning of his final year in office. Our nation had never seen anything like it. Even Republicans like former Senator Chuck Hagel of Nebraska who also served as Secretary of Defense began to express concern about what was happening. The two major parties were rivals, to be sure, but throughout our history they had always been willing to compromise to pass legislation for the good of the country. This changed in 2009, and it didn’t make sense. Republicans had been better than this. So what happened? What drove them to the point of becoming so uncompromising that they had rendered our government dysfunctional? What I saw in Congress reminded me of the attitude that has been so prevalent among evangelical Christians, a “my way or no way” kind of faith that insists it alone possesses the truth of God. That attitude had also made them absolutely uncompromising on moral issues. They believed (and still believe) the nation had to pass laws that were consistent with their views on abortion, gay marriage, prayer in pubic schools, and the like, or be condemned and rejected by God. It occurred to me that there was a connection between the no compromise attitude of congressional Republicans and the theological and moral absolutism of evangelicalism. After all, evangelicals had gained the reputation of being the largest and most reliable Republican constituency in the country. Had they become so influential that they had convinced or coerced congressional Republicans to become as uncompromising as they were, especially in regard to hot button moral issues? In other words, had evangelicals pushed Republicans to think politically the way they thought religiously? That became the focus of my research, and, oh my, what I uncovered was shocking. 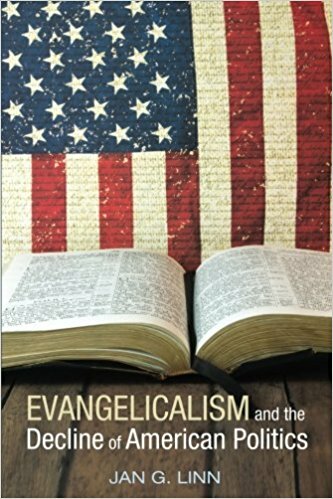 The book tells the story of evangelicals not simply becoming political (nothing wrong with that), but politically partisan (a lot is wrong with that), and how their influence has been damaging both to the nation and to Christianity. The book is well documented so that I don’t make claims without evidence to support them. It also provides ample evidence that in spite of evangelicals insisting they speak for most Americans when it comes to moral issues, the opposite is actually the case. For years surveys have shown that evangelicals have been and still are out of step with the views of the majority of Americans. In the past I have been hesitate to aggressively promote my own books, but this time I believe the role evangelicals have played in the decline of civility in our nation in general and in American politics in particular is too serious not to promote the book as much as I can. So I am urging you to read it, and I also hope you will tell others about it. What that means is that if you or a group to which you belong is willing to sponsor a public presentation on the book in the coming months, I am willing to be there at no charge. I will even pay my own travel expenses. That is how much I believe in this book. So I hope you will read it, and then help me have a public venue to talk about it in your area. It is a Cascade Books publication, an imprint of Wipf and Stock Publishers, and is available everywhere and online in paperback and ebook form. There is a bookstore in D.C. I want to contact about a reading, Dixcy, called Politics & Prose. Know anybody who works there? Thanks Jan. I look forward to gaining a greater understanding of what we all knew was going on. The Republican Party has lost it’s way and we’re all being hurt as a result. Obviously I want to know what you think of it. Jan, knowing your background, and having had past discussions with you about holding disruptive forces in America accountable for their thinking, their behaviors and their actions, I look forward to reading your new book. I actually ordered it a few days ago and it is due to arrive today. Thank you for all you do to help return “civility” to the American consciousness. John, thank you for ordering the book. I always value your comments so I look forward to hearing your reaction to the book. Thanks for being a voice that exposes the ugliness of partisan thinking and uncompromising attitude. We need more courageous people like you to help us understand what the real issues in life are about. Lee, your words are what encourage people like me to write. I am very grateful, and glad to be able to speak on behalf of the concerns you, I, and many others have. Jan, I have read your book “Evangelicalism and the Decline of American Politics”. To begin my response to you, I must admit and declare that I am not a political expert, nor a religious expert. (Those two descriptions are definitely oxymorons to me.) But, I can share that I feel that I have a better than average, and probably (what many might consider) an extensive knowledge and background on both politics and religion. And, I write extensively about God, Religion and Politics in my still unpublished books. 4.) “we are going to convince the world of this truth (?) – come hell or high water”. And, I have long observed the evangelical connection to the Republican Party, to use as a platform and deliver their message in an attempt to control the morality of the American citizenry. For me personally, I have concluded that “enough is enough”, because their views (as you demonstrate), do not represent the vast majority of Americans and American Voters. We must find a way to, at least, neutralize their power within our, now fragile, political system. But, my previous strong conclusions were based mostly on observation, experience and intuition. This is why I wanted to get and read your new book. Jan, your book, is a thorough and convincing presentation of these conclusions and of connecting the dots, as you say, with significant experience, research, facts, and truth of almost “biblical” proportions! It is so well written and it demonstrates your abilities to make a presentation with amazing clarity, without strong “emotional” or “this is my Cause” influences or biases (what I call, affectionately – “fan-based obsessiveness”). Evangelicals must somehow be convinced to change their, television created for prime time rhetoric, from “Gaawd Is On My Side” to “God Is On Everyone’s Side”. So, thank you for what you are doing to educate the American Public on this very important issue, and for your current and future efforts to hold those extreme elements of our society accountable for their beliefs, attitudes, behaviors and actions. The significant and difficult dilemma that lies ahead is “what are we, the American Citizenry, going to do about it”, particularly considering our current political environment, where the new norm is that “truth is a lie”! And, this is where we all will now need your continued advice and counsel. In your closing chapter, “Born Again Evangelicalism”, you make the case that “This is what partisan evangelicalism urgently needs – “being born again, perhaps again and again”. You state that “the term ‘born again’ describes the decisive change evangelicals believe anyone (including themselves – my words) can (and must) experience through conversion.” And, you make suggestions as to what they can and should do about it, with an intention of changing in some way, to be born again. So, in effect what you are now really saying, is that the change that We would like to see (from them), must come from within themselves! And, while I agree wholeheartedly with this premise, the change We would like to see is unlikely unless there is a significant grass roots effort to change from within, led by a unified and coordinated effort from the top down. But, while I can emphasize with your “hope” that this can be accomplished, and your suggestions are definitely good ones, historically, extreme elements of any political or religious group have been led to conversion by a majority of outside elements, either by negotiating conversion or concluding in eliminating the extreme group altogether. Japan is an example of how the threat of further nuclear annihilation, led to an effective conversion from within. And today, the hope that the religion of Islam will some day “see the light”, rests solely on outside led forces somehow eliminating all the extreme forces within the Muslim faith itself. Only then, will the remaining sects within their religion be able to begin some kind of peaceful and unified conversion from within. Also, outside elements (US, China and Russia) somehow working together, are the only hope to force negotiation to avoid far east nuclear annihilation. Jan, my view is that the real moral majority of other religions in America, and the real political majority of Democrats, other Republicans and Independents, must somehow come together from the outside, and then make it clear that through sanctions and/or advice and council, that if evangelicals want to remain as an extreme element, they must keep their own business to themselves, and We must deter their ability to proliferate their extreme beliefs on to others, so that these extreme beliefs can be held in check. So, this is where we will need your help. How do we do this? John, this is an very thoughtful response to my book, as well as a good summary of it. I hope others who get my blog will read what you have written. I agree that change within evangelicalism will need some outside stimulus. I would say it is a “both/and” rather than an “either/or.” Pressure from the outside and chase from within. But people must first become aware of the problem, which, as you note, is why I wrote the book. I can only hope others will read it, and even hope more than a few will examine what I have said with the care and thoughtfulness you have. Many, many thanks. I am cautiously optimistic that people are ready to speak out against both political and Christian extremism, so, yes, the pressure from the outside might be beginning. Thanks, John. It is titled, “Moore, Trump and the Right’s New Religion”, by New York Times journalist, Charles M. Blow, chblow@nytimes.com, Facebook and Twitter (@Charles MBlow). It is very revealing, as is your book. You might find your book to be of interest to Charles Blow and the NYTimes. This is more optimism, as you say, that “people are ready to speak out against political and religious extremism”. And, the question still remains: What are We, the American Citizenry, going to do about it? Thank you for the reference, John, and the excellent suggestion to send Charles Blow a book. I will talk to my publisher about doing that. Coming from them it might get his attention better than I would.